The kiwi plant, Actinidia arguta, is a vine growing perennial. With full sun to light shade and well drained soil, it blooms flowers in late May to early June. It’s a bit smaller than a tennis ball in size. Its fuzzy peel surrounds a green fruit with black seeds and creamy white center. This low calorie fruit has a sweet/tangy taste. Choose your kiwi carefully. Look for kiwi with no bad soft spots or bruises. Kiwi may have a little give in its touch but should not be mushy. After harvesting this fruit allow it to soften a few days and keep at room temperature or refrigerate. It can store in a refrigerator for 5 - 6 weeks. Kiwi is a powerhouse of nutrition! It has health benefits for the body, inside and out! - Harvest fruit from organic kiwi plant. - Cut the fuzzy skin from the kiwi. (the inside peel can be used to exfoliate and smooth skin). - Slice the green part of the kiwi and eat. - Toss organic kiwi in salads, fruit tart, yogurt. 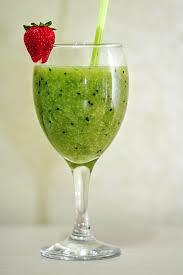 - Blend kiwi fruit in healthy smoothie recipes. - Blend kiwi fruit healthy juicing recipes. I believe beauty begins from within. What you eat/drink affects your body inside and out, your overall health as well as your skin’s appearance. It’s a choice anyone can make, but sticking to a healthy diet may be a bit more difficult for some than others. That’s okay. Just do something, even in small steps. Before you know it your body will crave healthier foods. You may find yourself soon tossing unhealthy foods aside. I love to blend organic kiwi in smoothies, especially during the hot summer months. Kiwi smoothies are packed with nutrition and delicious. Its sweet/tangy taste is not overbearing when mixed with complementary fruits or vegetables. Here is one of my favorite powerhouse kiwi healthy smoothie recipes. You can add or replace this homemade recipe with any of your favorite fruits or vegetables. Antioxidants seek out and attack free radicals. Free radicals speed up the skin’s aging process. Collagen is broken down and oxygen levels are reduced in cells. Free radicals can show evidence of poor skin conditions: wrinkles, pre-cancerous or cancerous lesions, sagging, discolorations, age spots and other pre-mature aging. Antioxidants boosts immune system, assists in skin repair, strengthens blood vessels, reverses skin discolorations, reduces wrinkles and protects against sun damage. apples, avocado, apricot, asparagus, berries, broccoli, brussels sprouts, cantaloupe, carrots, cauliflower, corn, eggplant, grapefruit, green peppers, kale, kiwi, mango, nectarine, orange, papaya, peach, plum, prune, raisins, red grapes, red pepper, spinach, snow peas, squash, strawberry, tangerine, tomato, yellow pepper. CAUTION! Vitamin C is found in many homemade or over the counter skin care products. Vitamin C may be irritating to some. If you experience rashes, redness, small bumps or any discomfort discontinue product use immediately. Contact your health care provider, if needed. Check expiration dates on skin care products. Throw out outdated products. Only buy products that are sealed tightly and properly stored. Store your product in a dark, dry, cool location. CAUTION! Consuming too much vitamin C can be toxic! Contrary, don't be vitamin C deficient. Maintain a proper balance for a healthier you. 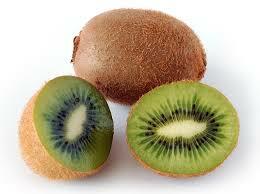 The kiwi plant bears antioxidant fruit with lots of benefits for the body and skin! Looking for more homemade skin care tips? Find them, now!